Sisyphus only had to get one rock up the hill. Pat Connolly and John Ahern have to coax 3,000 sheep over Montana’s Absaroka Beartooth mountain range, past the odd grizzly bear, gray wolf and wolverine. 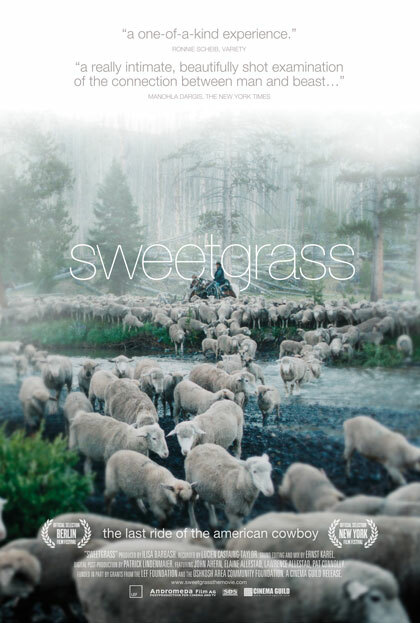 The near-perfect documentary “Sweetgrass” records the ranch hands’ journey on a beautiful, arduous, on-the-hoof drive. Filmmakers Ilisa Barbash and Lucien Castaing-Taylor rigorously follow the cinema-verité creed: no sonorous Morgan Freeman voiceovers, no explanatory intertitles until the finale, just carefully observed reality. The first quarter-hour goes by without any dialogue whatsoever, just the bleats of sheep gamboling, grazing and being sheared. The first human speech, a ranch hand cursing an uncooperative ewe, comes as a shock. Even before people show up in significant roles, the movie is engrossing. The sheep have an impressive vocal range (Amy Winehouse! Taylor Swift! Harry Connick Jr!). Their expressions of befuddled surprise are delightfully comic when they discover the camera spying on them, or when they get flipped on their backs for a full-body shave. It looks like it tickles. Connolly, a youngish ranch hand, and Ahern, a weather-beaten veteran herder, are as mismatched as any duo in a buddy-cops movie. The older man knows that lips were designed for smokin’ cigarettes and singin’ cowboy songs, not talkin’. Occasionally he will address the sheep, urging the “ladies” to move along. As far as chattering with Connolly, he’d as soon not. He takes each day of backbreaking toil in paradise without a word of complaint. Connolly is still adjusting. He looks the part of the taciturn Marlboro man, but he’s not quite the strong, silent type he appears. When the sheep become obstinate halfway up a steep rise, he unleashes torrents of profanity that would embarrass a sailor. In one stupendous shot he stands on a mountain peak, not to appreciate the view but to get cell-phone reception. He calls his mother, unloading all his frustration, anger and exhaustion. He’s a speck in the distance as the camera majestically pans over the landscape that has driven him to the point of tears. His knees are shot, his border collie has run its paws bloody, his horse is hide and bones, and he’s about to snap. “I’d rather enjoy these mountains than hate ‘em,” he moans. He adds that he is saying his prayers. Then he goes back to work, more or less rejuvenated. The closing title informs us that this journey was the last of its kind in Montana; declining markets for wool and lamb have taken their toll. There is no twilight-of-a-tradition sentimentality in the film, though. It tells its story in the visual equivalent of Cormac McCarthy’s muscular, stripped-down prose. With its intimate attention to detail and majestic Big Sky vistas, the film balances between anthropology and art. COLIN COVERT. April 15, 2010. Star Tribune.